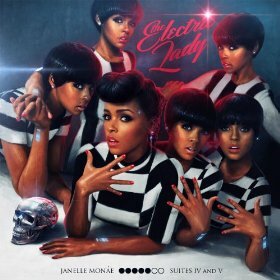 If this is the first you’ve heard of neo-soul’s most electric lady, Janelle Monae, then sit back and listen closely. Her retro-inspired vocals are infectious and you can tell she’s done her homework as a soul singer. Even beyond her music, her resume is a force to be reckoned with in today’s “accidentally famous” one-hit wonders. At the age of only 17, she founded the Wondaland Arts Society in Atlanta, Georgia, a collective of young artists and performers featuring Nate Wonder of the duo Deep Cotton, punk poet Chuck Lightning, Isis Valentino, and other faces of Afrobeat, Afropunk, dance, and poetry. She first broke onto the hip-hop/R&B scene with Outkast’s Idlewild and released her first solo album, Metropolis, in 2007. More recently, she contributed to fun.’s iconic summer smash, “We Are Young.” Janelle has always been inspired by alter egos, robots, Dorothy from The Wizard of Oz, and various theatrical elements. Electric Lady features segues, which sound like 1950’s movie soundtracks and PSA’s for Wondaland. Even better, it’s a veritable dream team of talented musicians, as she collaborates with Prince, Erykah Badu, and bass virtuoso Esperanza Spalding. This album is a real treat, a soul party where everyone is invited. “Givin Em What They Love” features Prince on a dirty blues guitar, with badass lyrics and a badass beat that’ll make you want to move. On its heels is the sassy, snappy “Q.U.E.E.N.,” a duet with Erykah Badu. The title track showcases the vocal talents of Solange Knowles, and has been remixed by Cee-Lo, Outkast’s Big Boi (a longtime friend and collaborator). The lyrics are fierce and beautiful in their ballsy, shout-it-out simplicity: “Electro, sophisti-, funky lady/We the kind of girls who ain’t afraid to go down/Electric ladies go on and scream out loud.” There’s a lot of strength and substance here, from “We Were Rock n’ Roll,” a disco-flavored anthem to nostalgia, youth, and the one that got away to the funky “Ghetto Woman” and the whimsical “Dororthy Dandridge Eyes” featuring Esperanza Spalding’s formidable bass chops. The production value is sleek and a true testament to Janelle’s vision as an artist. I personally can’t wait to see what she comes up with next.